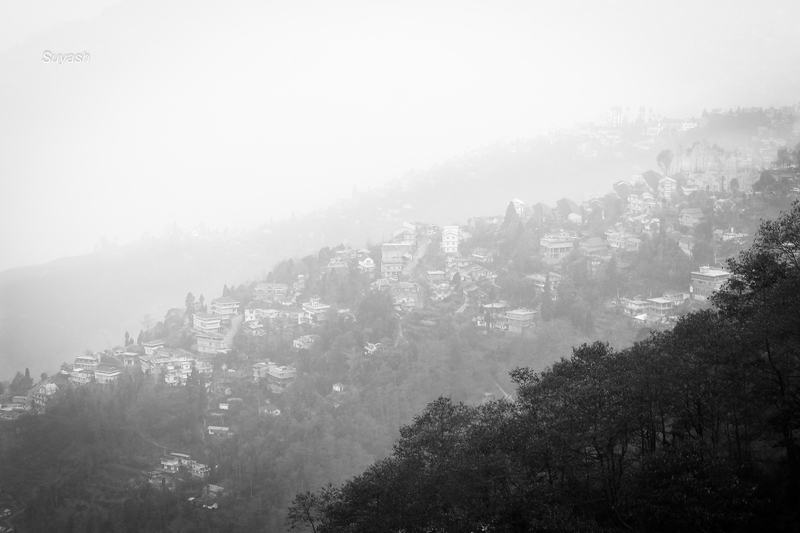 This was the late morning view from our hotel balcony when we had visited Darjeeling, a famous hill station in north-eastern part of India, in the spring of 2013. It was a picturesque sight with the slopes still enveloped in mist and just the form visible from far away distance. Darjeeling, in the state of West Bengal, presents a majestic sight of Himalayas due to its proximity to the borders of Sikkim – Indian state, Nepal and Bhutan. Kanchenjunga peak, world’s third highest mountain and part of Himalayan mountain range, can be viewed from Darjeeling on a clear day. Kanchenjunga mountain, located on the border of Nepal and India, is called Five Treasures of Snow after its famous five high peaks and is worshiped by the people of Darjeeling and Sikkim. However during all three days of our stay, we could not view it due to cloudy skies and fog. This calls for another trip to this beautiful hill station in future. This post was part of Weekly Photo Challenge – Enveloped. This entry was posted in India, Nature, Photography, Travel and tagged Black & White Photography, Darjeeling, Hill Station in India, Himalayas, India, Kanchenjunga, Kanchenjunga Five Treasures of Snow, Morning Fog, Morning Mist in Darjeeling, Nepal, Photography, Sikkim, Snow-capped Mountain, Travel. Bookmark the permalink. I visited this place in 1992 with my parents. Wish to visit again. Such a beautiful place. Brilliant capture as well. Dear Suyash! … You have been lucky to visit Darjeeling…. It is such a gorgeous, mesmerizing place, isn’i it?… A wonderful shot, indeed!. Thanks a lot Aqui for your kindness. It is indeed a very beautiful place. Though its not very far from my place, we could never plan to go there unless this trip. ~I love Darjeeling! Went there a few years ago, and the place felt simply so magical! Darjeeling is really a beautiful hill station with its own charm. I am glad to know that you have visited the place. Did you see the Kanchenjunga peaks from there? So beautiful. When is the best time to visit Darjeeling? Great pic! Love it! Thanks a lot Cerita. I guess Darjeeling is best visited in spring and summer, around the months from late Feb to July. Better to avoid rainy months. Mine as well 🙂 Thanks Andy for visiting my blog on this beautiful place.